"See what happens when Dez X is gone?" Wood writes. MANSFIELD, Texas — With a 3-5 record, it’s safe to say that Dallas Cowboys fans aren’t happy right now with how the season is turning out for America’s team. That dissatisfaction doesn’t discriminate, even if you’re just 7 years old. Ask Rylan Wood, he’s a second grader from Mansfield, who isn’t very happy with the team he’s rooted for all his life. 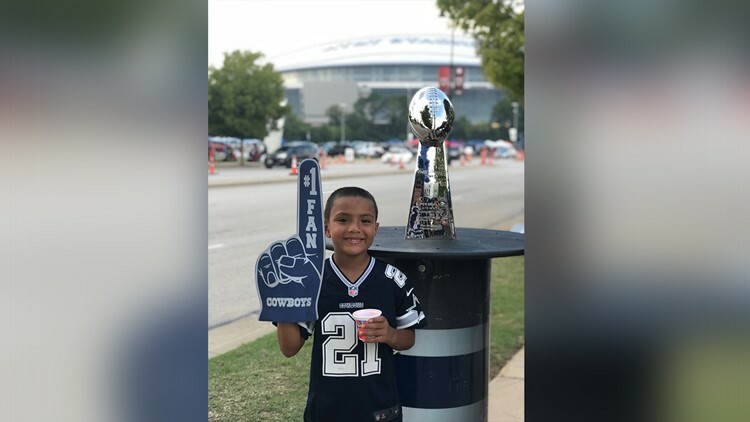 On Monday, as Wood and his mom were watching the Cowboys lose to the Titans during primetime, he vowed to do something if the ‘Boys didn’t pull off a win. Spoiler, they didn’t. “He told me if the Cowboys lose, I really want to write a letter,” his mother, Kayla Jimenez, said with a laugh. “So, I was like OK."
“He told me that he wanted to write a letter to Jerry Jones,” Jimenez said. 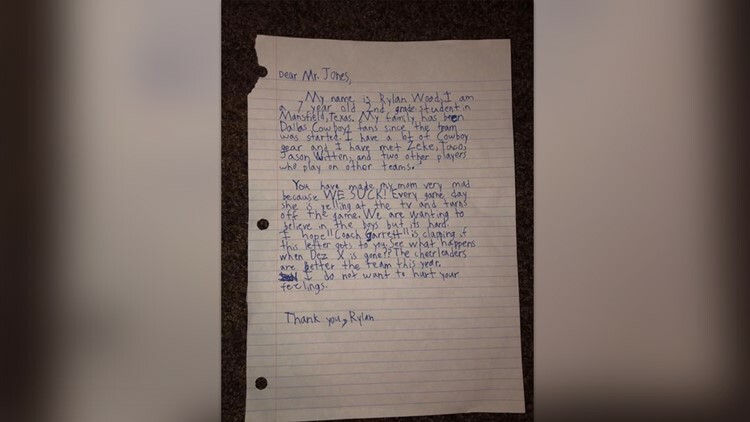 Rylan Wood, 7, penned a letter to Jerry Jones on notebook paper. The handwriting is a little squiggly and Jimenez helped with the spelling of some words, but the finished product is simply too funny. Wood didn’t get to see the end of the game because it was a school night and he had to go to bed. “The first thing he asked me when he woke up was, ‘Did we win?’” Jimenez said. “When I told him no, he said, 'OK, I’m writing this letter after school.'" So, Wood penned a letter to Jones on notebook paper. The handwriting is a little squiggly, and Jimenez helped with the spelling of some words, but the finished product is simply too funny. Wood starts the letter informing Jones that he’s a lifelong fan. When he was less than a year old, Wood had a seizure and had to be sent to Cook Children’s. There, he met several Cowboys players like Demarcus Ware who were there to cheer up patients for the holidays. He’s even met Ezekiel Elliott after attending a camp he hosted. Then, Wood doesn’t pull any punches. He starts by letting Jones know that the Cowboys are letting his mom down, who is also a diehard fan. That of course is a cute dig at Garrett’s sideline mannerisms, which often include a lot of clapping before and after plays. Wood then offers an opinion that things might not be this way if receiver Dez Bryant hadn’t left. Bryant was signed by the Saints on Wednesday. “See what happens when Dez X is gone?” Wood writes. Jimenez thought the letter was so funny that she figured she’d post it to Facebook before sending it off in the mail. No surprise, it’s getting some shares. Nothing personal, right, Mr. Jones? It’s alright Wood, sometimes the best love is the toughest.